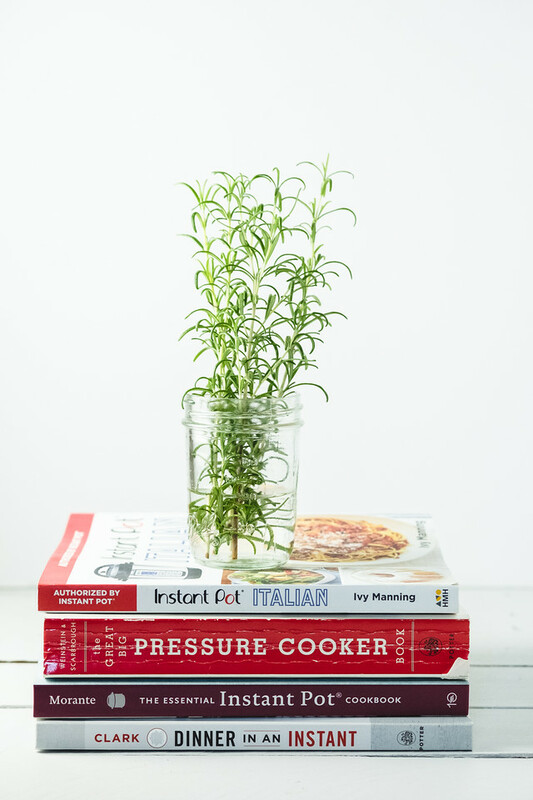 You are here: Home / Books / The Best Instant Pot Cookbooks! Have you jumped on the Instant Pot (or electric pressure cooker) bandwagon yet? I did and I love my Instant Pot! 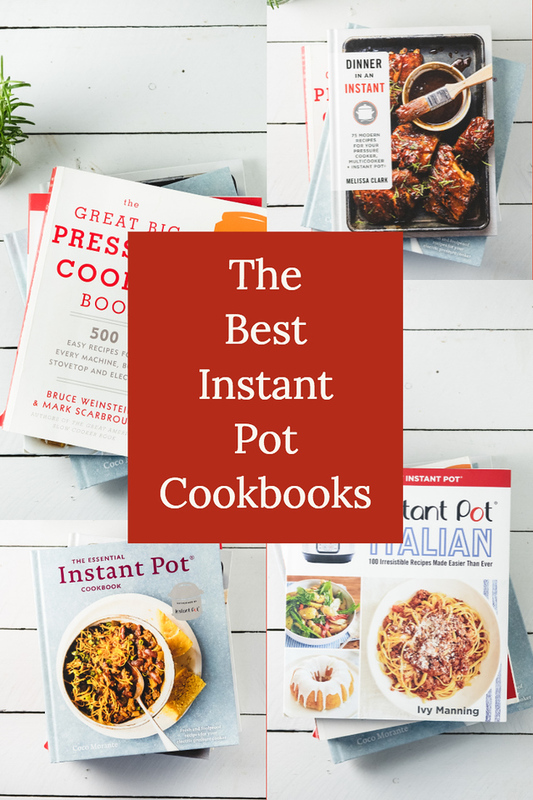 There are lots of Instant Pot Cookbooks out there and more popping up everyday. These are the Instant Pot Cookbooks that I think are the best. I plan on updating this post regularly! I was starting to write a review of one of my favorite Instant Pot Cookbooks and I decided it might be better to put them all in one post. A post that I can update regularly as I try new cookbooks. Let’s face it, there are a lot of Instant Pot (or pressure cooker) Cookbooks out there. It can be daunting. I am here to share with you my favorites. 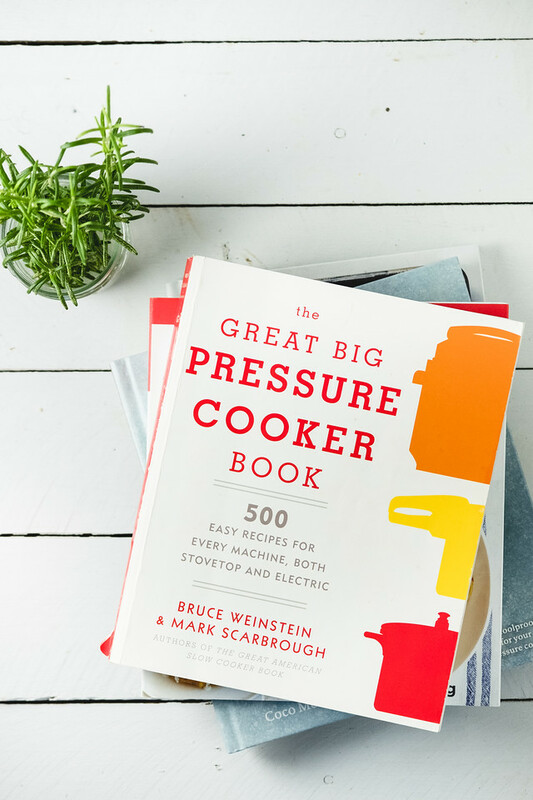 The Great Big Pressure Cooker Book by Bruce Weinstein & Mark Scarbrough is my favorite easy Instant Pot Cookbook. It’s not even specifically for the Instant Pot – it’s tagline reads 500 Easy Recipes for Every Machine, Both Stovetop and Electric. Every recipe contains instructions for both stovetop and electric pressure cookers. I love that under every recipe, it states how much effort, what kind of pressure, time under pressure, what kind of release, and how many servings. The recipes are organized by 6 sections: Breakfast, Soups, Meat, Poultry, Fish and Shellfish, Vegetables Beans and Grains, and Desserts. The recipes truly are easy and everything I have made from this book, I have loved. I do need to mention is that sometimes I find his times a little big longer than necessary. What I usually do is do a quick search online for similar pressure cooker recipes and adjust the time accordingly. For example, for the Balsamic and Orange Glazed Chicken Thighs, he said to cook for 15 minutes. I searched for similar boneless, skinless chicken thigh recipes and ended up setting the time for 7 minutes. From this book, I have made: Instant Pot Red Wine Beef Stew, Instant Pot Pork Lettuce Wraps, Instant Pot Shrimp Risotto and Instant Pot Ground Pork and Pasta! 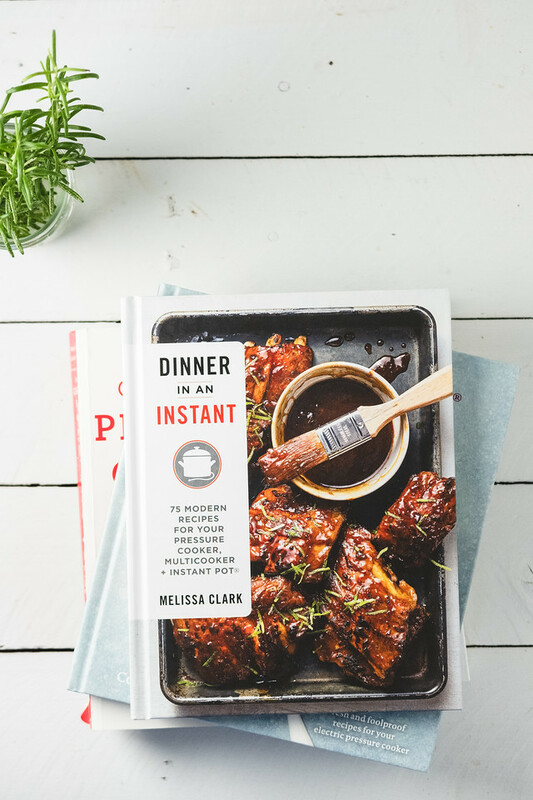 Dinner in an Instant by Melissa Clark is another great Instant Pot Cookbook. Some of the recipes are more complex, but the extra payoff in flavor would be so worth it! The book is divided into 8 sections: Yogurt Cheese and Eggs, Meats, Seafood, Grains and Pasta, Beans, Soups, Vegetables, and Desserts. I use her method to make perfectly cooked soft boiled eggs every time. If you search the Internet for how to make soft cook eggs in the Instant Pot – you’ll see that there are a lot of different opinions. I decided to try her method first and then try a few others, but hers worked so perfectly, there was no need to try another. I’ve marked so many things to try, but I did make her Instant Pot Steel Cut Oats with Maple Syrup and it was so good! Black Beans with Green Chiles and Cumin is next on my list. I love The Essential Instant Pot Cookbook by Coco Morante. It has a pretty extensive introduction making it perfect for someone new to the Instant Pot. There is even a section on how to convert regular recipes to Instant Pot Recipes, which I’ve found very helpful. The book is divided into 8 sections: Breakfast, Beans and Grains, Soups and Chilis, Poultry, Beef and Pork, Vegetables and Side Dishes, Desserts and Pantry. The pantry section contains recipes to make pantry staples – like a marinara sauce and beef bone broth. I have marked several recipes to try including: Dijon Chicken and Wild Rice Pilaf and Fettuccine with Bolognese Sauce. I made the Instant Pot Frittata with Spinach and Mushrooms and we loved it! I will never go back to my old way of making frittatas again! 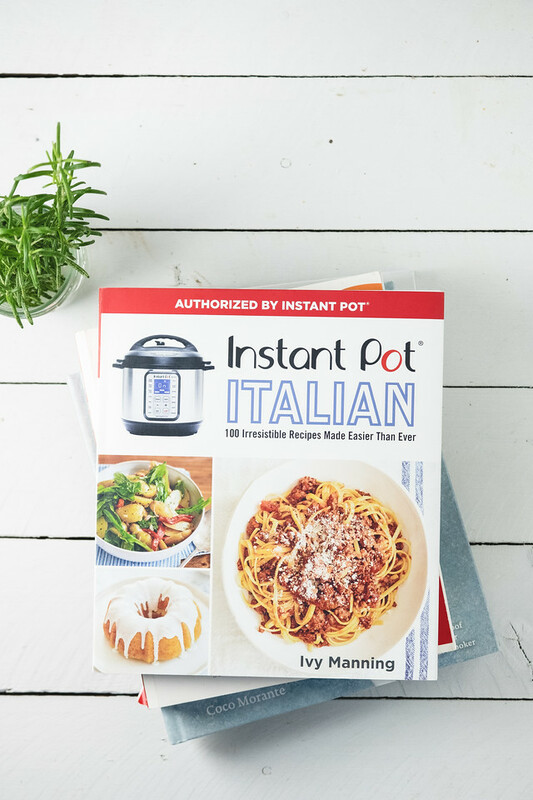 This Instant Pot Italian Cookbook by Ivy Manning is the latest on my Best Instant Pot Cookbooks list! I was immediately impressed with the range of recipes and the thoroughness of the instructions. The book is divided into twelve sections: Introduction, Ten Tips for Better Italian Instant Pot Dishes, Quick Safety Reminders, Must-Have Ingredients, Antipasti and Salads, Soups and Stews, Pasta and Grains, Poultry, Pork Beef and Lamb, Vegetables, Desserts and Pantry. I used her instructions and technique to make a pot of cannellini beans (using low pressure) and they were perfect! I made the Herbed Polenta the other day and that is now my go to polenta recipe!! I will be posting it later this week and will come back and update. There you have the Instant Pot Cookbooks that I think are the best! I will update this as I cook more recipes from them and as I add more cookbooks to the list. Please feel free to leave me a comment if there is a cookbook you think I need to try! Great selection of books! Will find these titles for reference. Thanks! 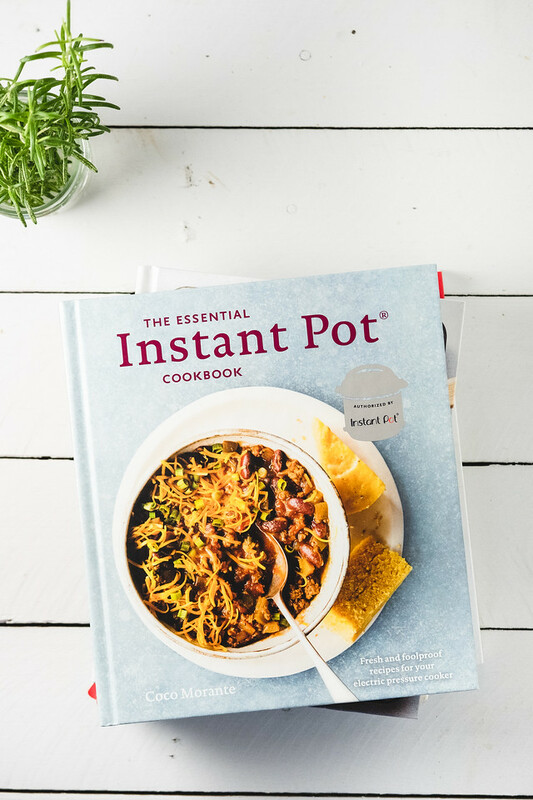 I don’t use my Instant Pot nearly enough – what a great idea to pick up a few cookbooks to use to get more comfortable with all it can do – it really is an amazing appliance! It really does help, especially when modifying existing recipes. It really is so good! I make beans in it at least once a week! I haven’t jumped on the bandwagon yet…but I am seriously thinking about it. Thanks for the insight in the post! It’s great! You need one! This is so helpful! I just bought an Instant pot!